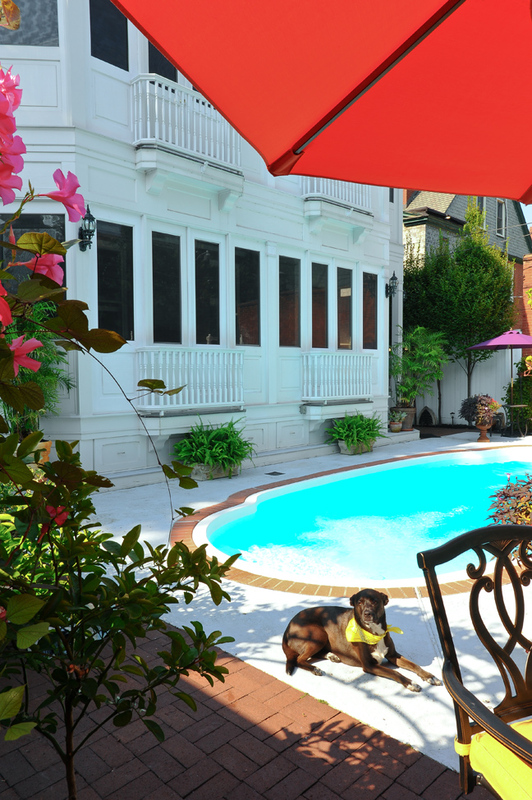 A Compton Heights Classic with a Touch of "Florida Casual"
After 15 years in sunny Florida, these homeowners moved back to St. Louis into a Tudor revival taht is classic with modern conveniences. In the entry foyer, gleaming oak flooring complements the orignal banisters and tiger eye oak treads of the switchback main staircase. 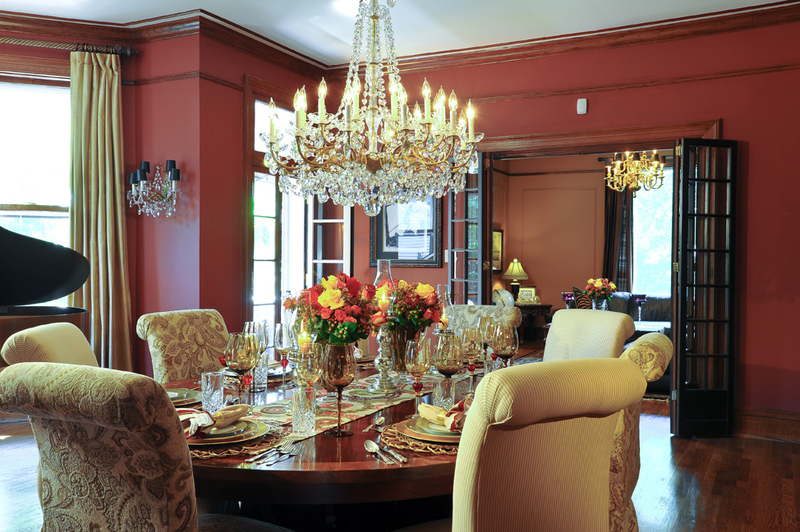 Original to the home, a spectacular Swarovski crystal chandelier glitters above the inlaid oval dining table. 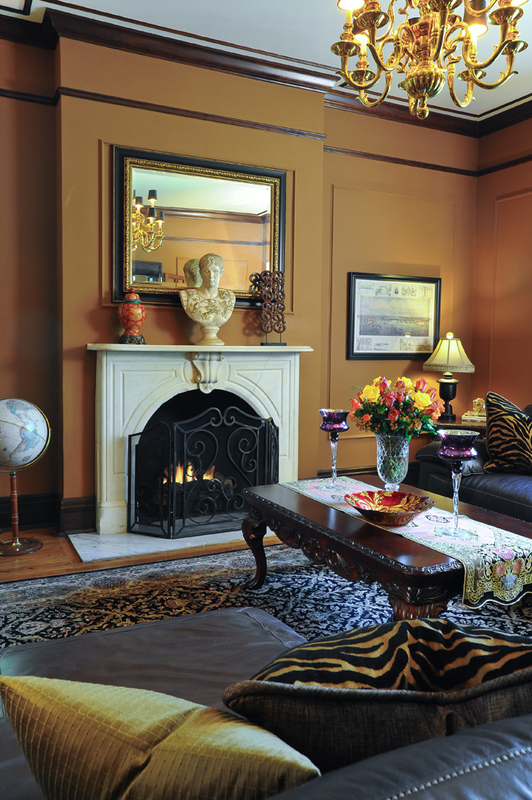 One of seven original fireplaces, this hand-carved marble gem warms the living room and is identical to another fireplace in teh adjacent foyer. 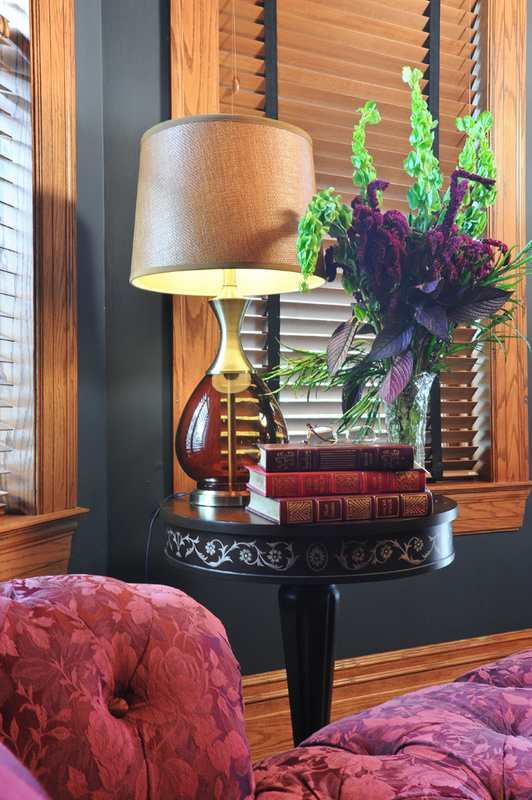 Rich wall colors and carefully selected accent pieces reinforce the home's historic character. The third-floor bath is a showplace with its original refinished clawfoot tuba nd authentically reproduced tile floor. 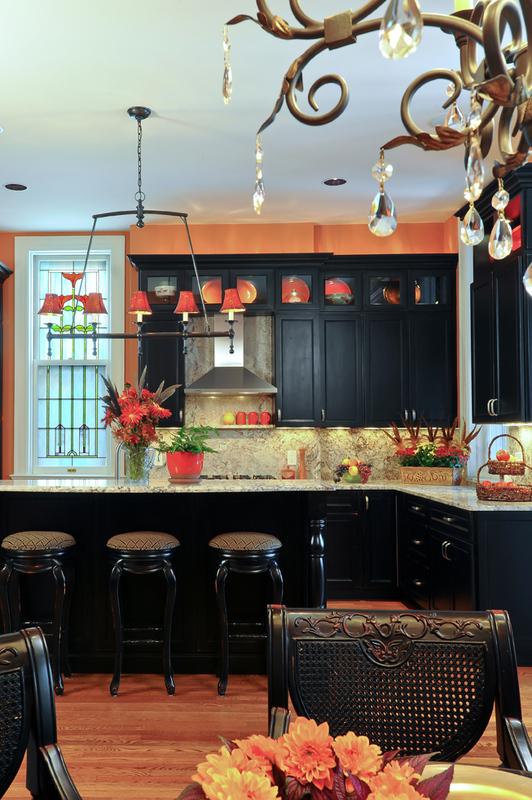 Once the servants' domain, the kitchen/breakfast area was opened to the rest of the home and moderenized to include a custom, granite-topped island, bold cabinetry, and an original art glass window. Piper, the owner's black lab mix, lolls on the pool deck. 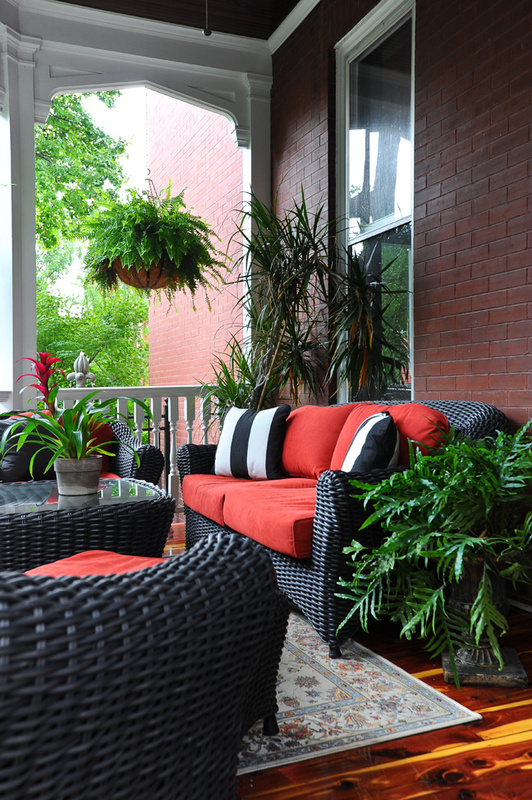 Several outdoor entertaining areas, including this luxurious side porch, invite relaxation. Defined by its landmark water tower, Compton Heights holds a place in history as one of the nation’s first planned residential developments. The 250-acre tract was laid out in 1889 and designed with curvilinear streets, lush landscaping and deed restrictions intended to preserve the subdivision’s tranquil “neighborhood” ambience. Although slow to capture the imagination of late 19th-century St. Louisans, the project gained momentum during the 1904 World’s Fair era, attracting wealthy merchants and manufacturers eager to display their affluence. Rich in period architecture and beautifully maintained, Compton Heights was designated a local historic district in 1978. It was Compton Heights’ quiet residential atmosphere that first attracted the owners of this three-story handsome Tudor Revival, which they purchased in February 2012. Still, it’s reasonable to ask what lured the homeowners back to St. Louis after 15 years in sunny Florida, but the explanation is simple. They’ve operated a successful transport-related enterprise on the east side of the Mississippi River for more than two decades. Once established, they determined that the company’s activities could be supervised remotely and moved to the Sunshine State, while maintaining a pied-à-terre here in the city. Recently, however, a major expansion of the business demanded more hands-on attention, and they returned (somewhat ruefully) to the metro area. Researching its history, Scott learned that the home was built in 1908 by a produce magnate from New Orleans. With eight bedrooms and 6,000 square feet on the three main floors, it easily accommodated the tycoon’s large family, and he emphasized his cultural roots with the addition of several ornate porches and Juliet balconies. Sadly, the original owner died only a few years after the home’s completion, and his funeral was held on the premises. Noting that Halloween is just around the corner, Scott mentioned that a 5-year-old child is reputed to have seen a ghost on the staircase, but the warmth of this gracious residence belies any hint of apparitions. The home has changed hands many times over the years, and at some point the magnificent two-story rear porch was removed, but later restored from early photographs. Throughout every transition, the home’s authentic character has been retained, and today the residence is a faithful blend of original elements and conscientious updates. Vintage features include countless French doors; seven fireplaces, two with hand-carved marble surrounds; the banisters, tiger eye oak treads, and magnificent art glass window of the main staircase; considerable trimwork and paneling; and pine flooring on the third floor. With a salute to the previous residents, Scott explains that most of the furnishings – all comfortable, tasteful and well-suited to the period architecture – were purchased with the home. The new owners have added a number of treasured family heirlooms, for example, a beautifully carved “kitchen” clock in the living room and a small china hutch in the breakfast room. 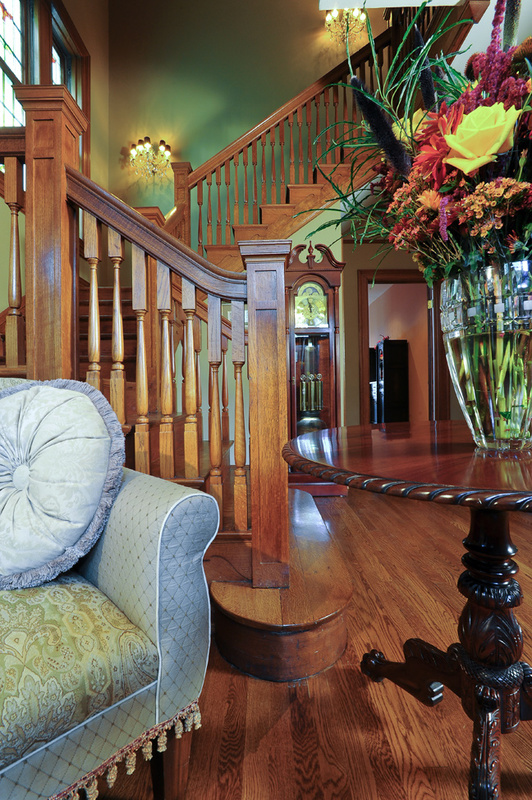 Often assisted by architectural design consultant Garison Salinas (featured in SLHL’s March 2013 issue), Scott acquired a variety of complementary antiques, including a Howard baby grand piano, dating to the 1920s-1930s and set in the dining room bay; a 9-foot-tall, 200-year-old wardrobe in one of the guest bedrooms; and a barrister’s bookcase that houses Scott’s cookbooks. Upstairs, various bedrooms have been repurposed for a media room, with balcony and a 72-inch flat-screen TV recessed in a former closet; a billiard room with an elegant slate pool table from an older home in University City; a separate room for card and table games, also equipped with a TV and a “very classy” foosball table; and Scott’s office. Surround sound is also installed throughout the home. Then he reveals the exotic surprise…Unseen from the street, the L-shaped, 2-story rear porch adds another 1,000 square feet of glassed/screened living space and overlooks a backyard that could grace the pages of any Florida design magazine. The lower level includes a view-packed dining area, and the freeform pool is surrounded by an abundance of citrus trees – lemon, orange, key lime, and grapefruit – and a fabulous array of tropical plants, all transported from the Sunshine State. The pool has been converted to saltwater, which Scott claims is superior to chlorine and much gentler on the skin. A bank of huge cabinet-quality drawers under the porch floor provides storage for pool accessories, and a side stairway accesses the basement cabana area. Casual furnishings for the porches and outdoor area were purchased for this home and reflect the owners’ taste for all things Floridian. Several fountains murmur softly in the background; an enormous, age-old flowering crabapple tree shades the side yard; and Scott proudly shows off the red cedar plank floor of one side porch, which he refinished with 10 coats of marine varnish. St. Louis is known for its meticulous, and sometimes obsessive, preservation of historic architecture. But this spectacular residence in Compton Heights proves that respect for tradition and casual contemporary living can exist in glorious harmony.